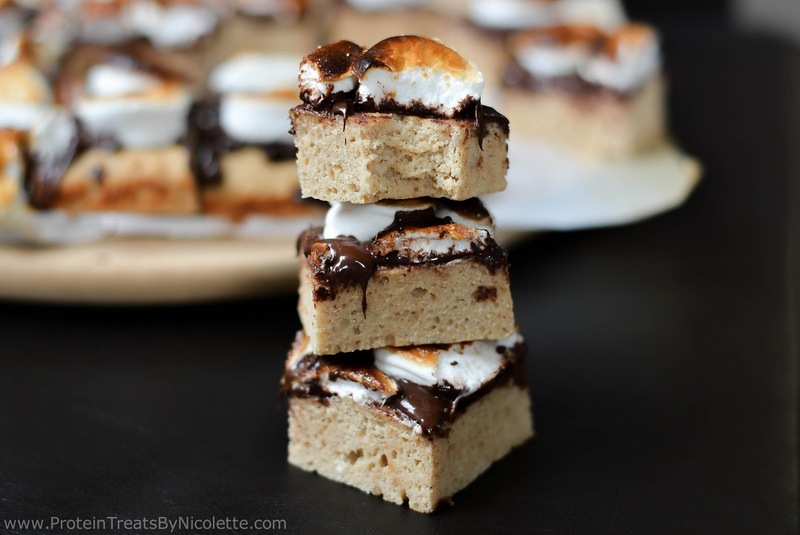 Who doesn't love S'mores during the cooler weather days? Hell. Who doesn't love S'mores at all times? 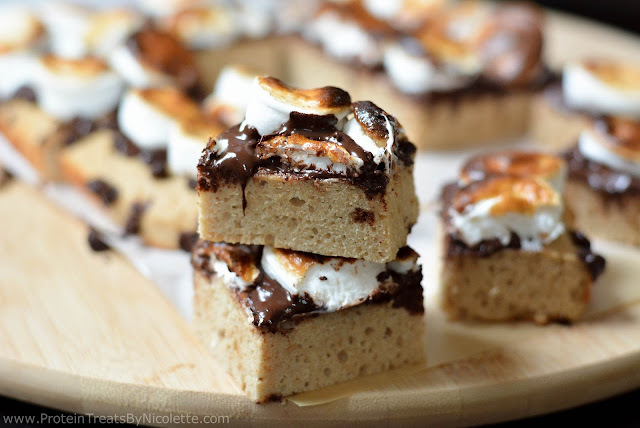 I think they are pretty perfect - gooey melty chocolate and marshmallow eaten with graham crackers. These bars aren't crunchy like the typical graham cracker, but the flavor is there! But let's not forget there is added protein in my treats along with healthier ingredients used to get the final sweet dish. Enjoy! 1. Preheat oven to 350 degrees F. Line a 9x9 inch baking dish with parchment paper and set aside. 2. In a mixing bowl, whisk together syrup, yogurt, milk, egg whites, and vanilla until smooth. 3. Add remainder of the graham cracker layer ingredients to the bowl of wet ingredients and stir until well combined. 4. Pour mixture into baking dish, evenly spread out and flatten to the bottom of pan, and bake in the oven for 24-28 minutes. Remove from oven and set aside. 5. Turn the oven broiler on. 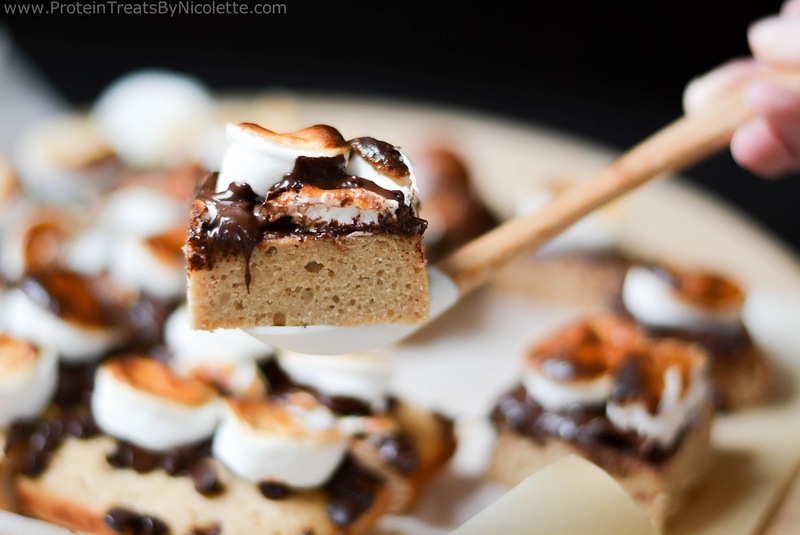 Top the cooked graham cracker layer with chocolate chips then marshmallows. 6. Cook bars again (under the broiler) until marshmallows are slightly browned on the top, about 2-3 minutes. 7. Slice into 16 even squares. Enjoy! 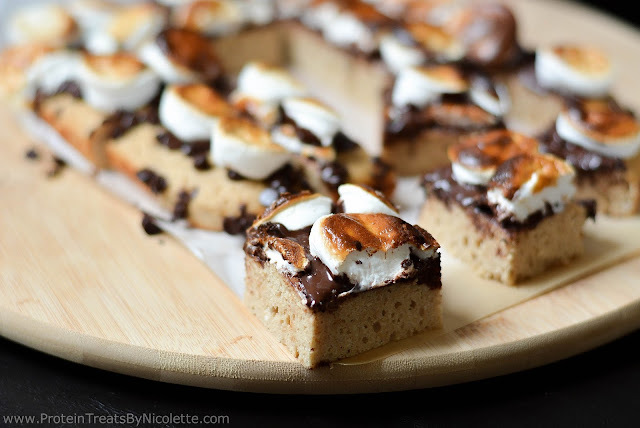 * When slicing the squares, spray the knife with non-stick spray so the melted marshmallows do not stick. * Eat and enjoy right when the bars are done baking! You can store leftovers in the fridge and reheat in the microwave or oven. 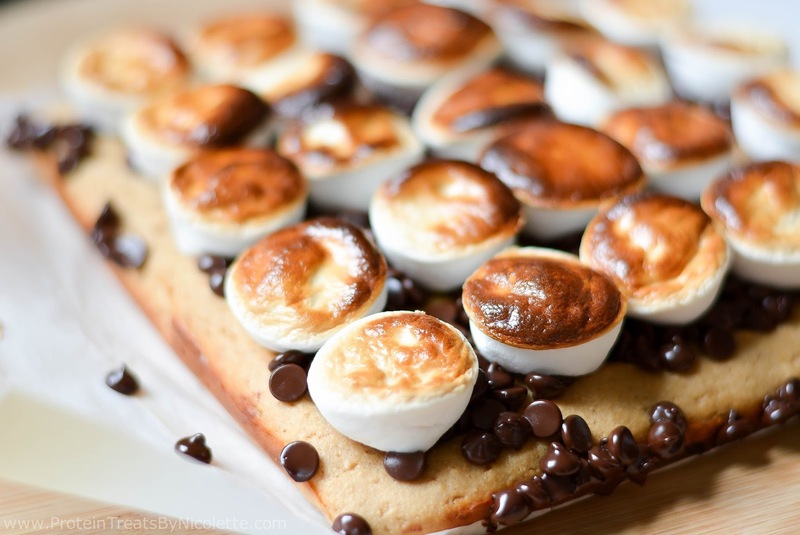 i love s'mores! I'm going to make these :D. I do not have dairy in my diet, can i leave out the yogurt/milk or substitute with something else? A couple friends and I just made these last night - absolutely delicious. We did everything we could to not finish it all in one sitting! Great macros too. Can't wait to try more of your recipes, thanks for sharing! !